Activation of a receptor with no known function in the brain reduces excessive alcohol use and the pain of withdrawal, according to preclinical research in male rats. The study, published in eNeuro, suggests a new approach towards the treatment of alcohol use disorder. More than a third of approved pharmaceutical drugs target G protein-coupled receptors (GPCRs). One receptor belonging to this family, GPR139, is highly expressed in the habenula—a brain region with a critical role in addiction. Olivier George and colleagues used a rat model of alcohol dependence and a substance that activates GPR139 to establish a previously unknown role for the receptor in addiction-like behavior. 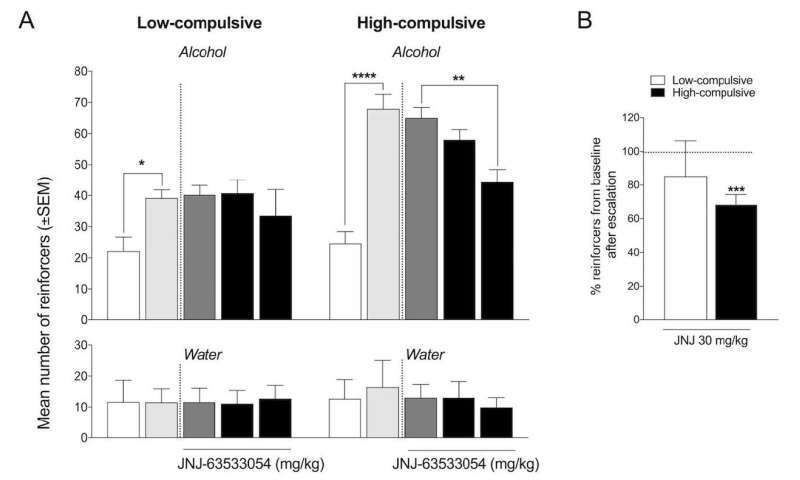 The researchers found that activation of GPR139 reduced alcohol intake and restored pain sensitivity thresholds only in alcohol-dependent mice that showed compulsive-like alcohol consumption akin to problematic drinking in humans. This study is the first to establish an effect of GPR139 manipulation on behavior and encourages investigation of the receptor as a potential drug target in the development of medications for alcohol dependence.